Business Gifts is rated 5.0 out of 5 by 5. Rated 5 out of 5 by peppermintpac from Perfect Gift for Vendor Purchased this for Vendor I was working with for almost a year in setting up a Group Cruise for my clients. He worked hard, especially towards the end and I wanted to express my thanks for all he did to help put this group together. He LOVED it....who wouldn't appreciate flavored popcorn anytime !!!! Rated 5 out of 5 by dwachtman from Great reviews! 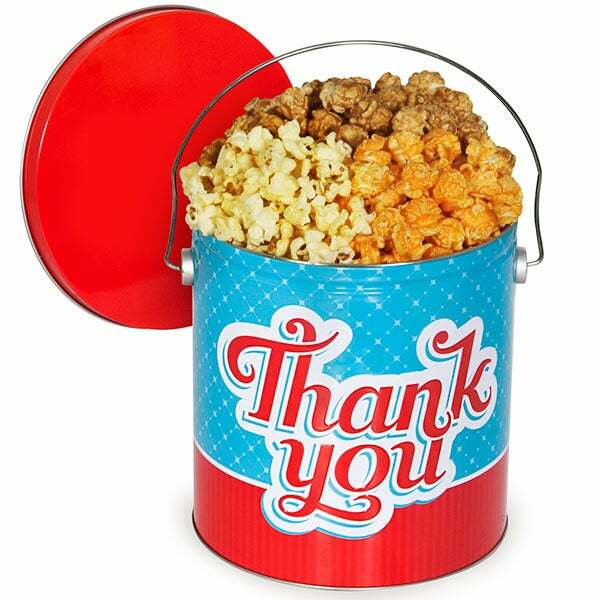 I bought Thank you Popcorn Tins People's choice for customers and have heard many thank yous for them. Customer service was also great to work with! Would use this company again! Rated 5 out of 5 by Ceezy from Great Surprise I bought this as a thank you gift for my cousin, for her hospitality while visiting in her state, she got it unexpectedly and loved it and the card. Rated 5 out of 5 by QueenD from Great Thank You Gift I purchased this item as a thank you gift. It was perfect! My friend raved about it! A tin full of gourmet popcorns is the perfect way to say Thank You to your most important clients. This beautifully designed tin is packed to the brim with a trio of gourmet hand-crafted popcorns including either the Traditional (Butter, Caramel, and Cheddar) or People's Choice (Caramel, Cheesy Cheddar, and Kettle) blend of popcorn. Whichever you choose - they'll be thanking you with every handful.